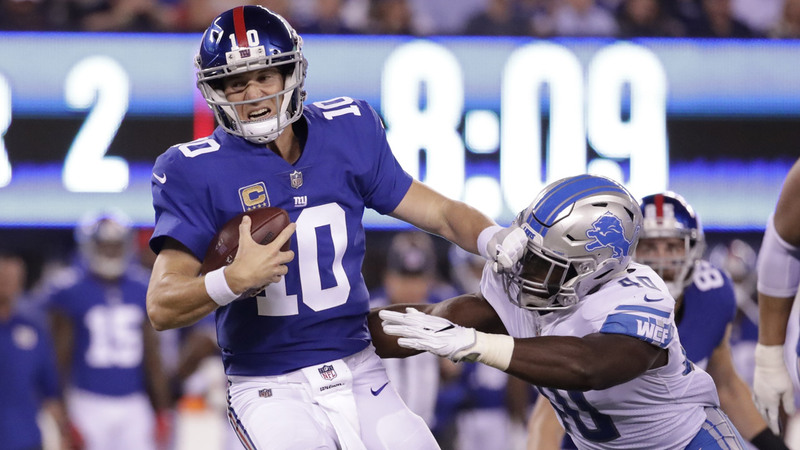 The New York Giants are benching quarterback Eli Manning, and Geno Smith will start this week against the Oakland Raiders. Manning has started 210 consecutive regular season games for the Giants, the second-longest streak by a quarterback in NFL history, behind Brett Favre's 297. He has started every Giants game since Nov. 21, 2004, when he took over for veteran Kurt Warner in his rookie season. Coach Ben McAdoo made the announcement Tuesday. Rookie Davis Webb will also play before the end of the season, if not this week. "Geno will start this week," McAdoo said. "Over the last five games, we will take a look at Geno, and we will also give Davis an opportunity." in the statement, the Giants (2-9) said Manning was given the option of starting to keep the streak alive, but declined. "My feeling is that if you are going to play the other guys, play them," Manning said. "Starting just to keep the streak going and knowing you won't finish the game and have a chance to win it is pointless to me, and it tarnishes the streak. Like I always have, I will be ready to play if and when I am needed. I will help Geno and Davis prepare to play as well as they possibly can."